Barcelona and Chile midfielder Arturo Vidal has praised his South American counterpart, Lionel Messi, for his phenomenal performance against Real Betis in La Liga. 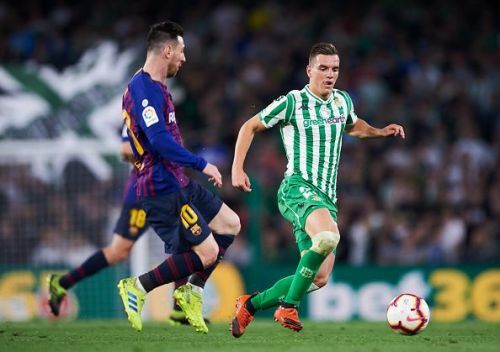 Lionel Messi mesmerized the football fraternity with his impressive performances against Real Betis in La Liga on Monday. The 31-year-old scored three goals in a 4-1 thrashing of Quique Setién's men. Messi scored his first goal through a sensational free-kick. It was almost impossible to stop the ball from going into the net. The second was a tap-in which was a result of nice link-up play between Messi and Luis Suarez. The five-time Ballon d'Or winner then completed his hattrick with an amazing lofted shot. The hattrick against Betis was Lionel Messi's 45th hattrick for Barcelona in all competitions and 33rd in La Liga, one shy of Cristiano Ronaldo's 34 hattricks in La Liga for Real Madrid. With this win, Messi also became the player to register the highest number of wins for Barcelona, a record previously held by Xavi. We have to enjoy (Lionel Messi) a lot, we have to take advantage of having him. His talent will never be seen again in the world. He’s so impressive. You saw it today and any time he goes on the pitch. I've changed side many times, I tried to adapt as well as possible. Today I felt comfortable, my team-mates made me feel that way. It's a very important win for everything it signifies. Betis are a great team. Messi, who returned to Argentina squad, will look to continue his impressive form when they face Venezuela in an international friendly on March 23. Barcelona will next face Espanyol on March 30 after the end of the international break.